This book is part of the Virtual Book Cafe tour for Seeds of Transition. I received a copy of Seeds of Transition free in exchange for an honest review. Enter the giveaway here! As the world’s population approaches 10 billion people, severe weather extremes diminish crop and livestock production, driving the demand for and price of food to new heights. The American government, as well as other powerful organizations, turns to the world of academia in search of gifted, albeit unlikely heroes. Dr. Jarod Farra is one of those unlikely heroes. An assistant professor of agriculture at Cornell University, Farra quickly finds himself at the forefront of both his longstanding dreams, and perhaps, some of his worst fears. Dread of the developing global food shortage and ever-worsening weather extremes cause cultural turmoil, political turbulence, population shifts, and economic havoc. Jarod and a range of characters come together to perform an experiment that will change the world, and provide new hope for generations to come with the most radical agricultural undertaking that society has ever seen. Carolyn Holland grew up during the 70’s in the coastal wetlands of North Carolina in a small, rural fishing village. She married right after high school and started her family, in the same community where she grew up. Though life took her to other places, she lived in the Appalachians for a time and later in Alabama, she found herself drawn back to her roots in Coastal North Carolina. With her three children grown now, she resides there still with her husband James Holland, a retired US Marine. Carolyn has been a writer for many years. In 2009 she began work as a freelance writer and ghost writer and worked on many works in the science fiction genre. Her own personal interest in agriculture, the environment and our effect upon it prompted a lot of study into the effect of weather patterns brought on by climate change on our food and water supply. 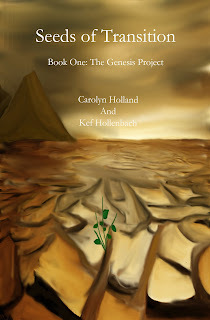 In 2012, Carolyn was invited by publishers; Books, Authors and Artists, to write and publish the trilogy titled The Genesis Project. The first book in that series is titled, Seeds of Transition. I liked the idea behind this book, but I found the way it got there a little dry. Plot: The plot centers around the near future when the world’s population reaches its all-time high. People cannot get enough food around the world, and extreme weather makes feeding the masses even harder. Jarod was a child during one of the worst disasters, but was able to escape to America. Now an adult, he has vowed to end world hunger and make the world a better place. I appreciated the somewhat more realistic aspect of the plot, versus many popular science fiction books that you see. However, in spots, the book read more like a political commentary than a fiction novel. Characters: I found it a little difficult to keep up with the characters. In several spots, the book jumped from decade to decade, which made it hard to me to figure out which character was what age at the time. There was not a whole lot of dialogue, which made it harder to learn who the characters were. Setting: Most of the book takes place around 2037, which is the near future. In some spots, the universe seemed identical to ours, and in others, far advanced or far behind. I didn’t know what to think of the setting, but I thought the attempt to make the book somewhat futuristic while maintaining the feel of life today was done fairly well. Writing: When I first started the book, I was pleased with the writing. It was vivid, descriptive, and told a lot of the story. However, as I continued reading, the book never seemed to start. It always felt like it was in the introductory phase of the story. I think I was to around 18-20 percent finished on my Kindle before I saw any dialogue. That made the book seem more like a history textbook than a novel to me. This is an innovative attempt at writing a realistic portrayal of science fiction. The writing is good, and the plot is interesting. However, I felt the execution of the story could have been a little better. Fans of realistic science fiction should enjoy this story. Thank you for reading the book. I love the breakdown you do for reviews 🙂 Always intriguing. First I’d like to thank Brenda for having us here today, we are really excited about this book tour, and secondly I want to thank her for her honest and thorough review of Seeds of Transition. Critical analysis of this quality will help us to make Seeds as good as it can be and will go along way in helping with the writing of the second book in the series, Leaves of Revolution. I will be around all day and would be DELIGHTED to answer any questions ! Most insightful review. Your review’s structure, plot, characters, etc., provide different viewpoints of a work which really make it so much more worthwhile. Differentiation between plot and storyline allow a potential reader to see if the book is a “buy now” or a “perhaps”.